The most important of calcium nutrition facts is that 99% of the body's calcium is found in our bones. Most of our calcium combines with phosphorus to make complex crystals that give bones its structural strength. If we become deficient in calcium then certain enzymes that are needed for metabolism begin to stop functioning. If you eat a high protein diet, containing lots of meat for example, then calcium is even more important. High protein diets can cause calcium to be lost from our body. Calcium Nutrition Facts: Why do we need it? 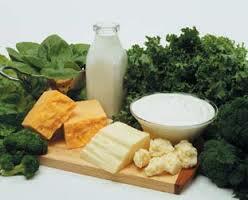 It should be noted that although milk and dairy produce are high in calcium, the body does not digest them easily. Therefore vegetable sources of calcium are best. In general the best vegetables high in calcium are the dark green leafy type. What causes calcium levels to drop? A diet that is high in protein, fat or sugar affects the body's ability to absorb calcium. A diet of refined foods, meats and soft drinks causes the body to excrete calcium because of the high levels of phosphorus. Consuming alcohol, junk food, caffeine and foods containing excess salt will also lead to the excretion of calcium. The hormone oestrogen helps the body to absorb calcium into the bones. Menopausal women and female athletes therefore require extra calcium in their diet due to their lower levels of oestrogen. Insufficient intake of vitamin D or an intake of magnesium or phosphorus in excessive amounts will inhibit the absorption of calcium into the bones. Therefore a diet consisting of whole grains, vegetables and fruits will supply adequate amounts of calcium whilst keeping phosphorus levels low. An excessive amount of calcium is a rare occurrence because our body self regulates it. An excessive intake of vitamin D, particularly from supplements, may lead to the body requiring extra calcium, which it will take from the bones, possibly leading to osteoporosis.